This is a curse. The words ‘Jesus Wept’ are known to be the shortest verse in the King James Bible (John 11:35). But in Ireland,England and Australia ‘Jesus Wept’ is used as a curse. You use it when you are irritated or annoyed. I don’t know the intention of the artist. Colin Booth nowhere explicitly mentions that he is a believer. But he does always search for a connection between the past and the present, and that is what these age old words ‘Jesus Wept’ in modern neon letters obviously do. Booth moreover always concerns himself with the relationship between the artwork and its surroundings and that is interesting here as well. For a number of months in 2012 these nine white letters shed their light near a railway station in Hastings, England. It is in adreary location. Did Booth mean that Jesus weeps about this? Or that Jesus in all manner of places – even at an anonymous tiny bleak station – shows his compassion? It can shock us that these very moving words can become a curse. As if nothing sacred is safe anymore, even something as intimate as the Redeemer who cannot control his tears because his best friend Lazarus has died. At the same time there is also a depth to this. Paul says that Jesus has become ‘a curse’ for us (Galatians 3:13). In a certain sense Jesus himself ‘cursed’. He claimed to be the new temple and in doing so suggested that he was of divine origin. Little was more blasphemous at the time. According to the Law of Moses this deserved the death penalty and that was in fact what was allotted to him. His resurrection showed this to be unjust. In retrospect it became clear that Jesus had not cursed himself, but that he had become a part of the curse that is over humanity – the separation from God whereby everything is subject to death. That is why he wept. He felt our deep grief. He became part of it and expressed through this what God feels for us. And in the end he experienced the deepest separation of God imaginable, when he felt abandoned by God and cried out with misery (Matthew 27:47; Mark 15:34). When God incarnated himself in Jesus he made himself vulnerable. He could be trifled with. For a magazine about Jesus for the wider Dutch market I recently researched how many times the word ‘Jesus’ is used in the Netherlands. 30 million times a day, it turned out, about twice a day per person. About 7 to 8 million times this is a curse, half a curse per Dutch citizen. As soon as there are words for God, people can curse. But at the crucifixion God chose to take the worst curse upon himself and he endured. Since then a believer can still be shocked or hurt when he hears or sees something that is blasphemous. But he also knows that God can stand rough handling and that he doesnot need a safeguard and protection. 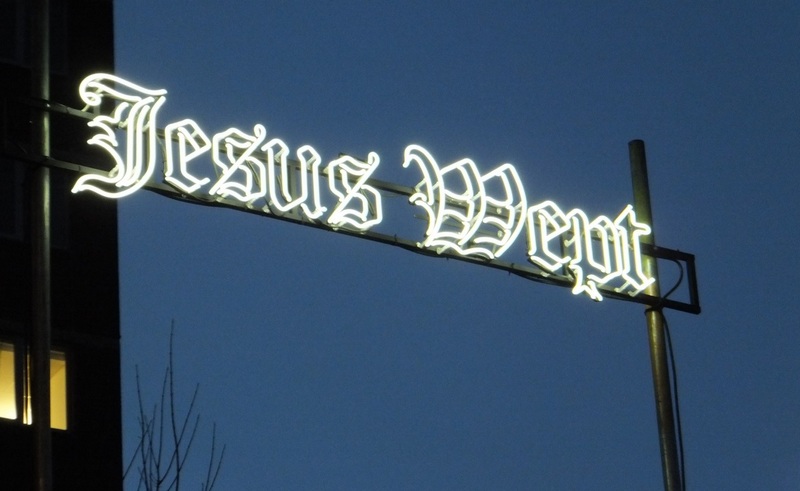 Colin Booth: Jesus Wept, 2012, neon lamps, glass, steel, 40 cm x 200 cm x 5 cm, 2012-2013 at the station St. Leonards Warrior Square in Hastings (England); 2014 at All Saints Church in Folkestone, England. Colin Booth (b.1951) lives in East Sussex, in the south of England. He has had numerous exhibitions in art galleries and museums in the UK and his artwork is in international collections. Booth makes conceptual installations: objects and combinations of objects that express certain ideas. Sometimes the idea is clear; sometimes it is more ambiguous. On his own website he shows more of his work ‘Jesus Wept’: http://www.colinboothart.co.uk/jesus_wept.htm. Read an interview with Colin Booth here: http://www.thejournal.co.uk/culture/arts/colin-booths-artistic-building-blocks-4427287.